Beer Bistro is a well-known spot to try a new beer and eat a few snacks in the St. Lawrence area. Their selection of craft beers is hard to beat. If you're not sure which beer to try, they provide 300ml tasting pints so you can try a few. Unlike the beer menu, the dinner menu is quite small, providing limited options. They are known for their mussel selection; if you ask us, you should stick to that part of the menu; everything else was quite mediocre. 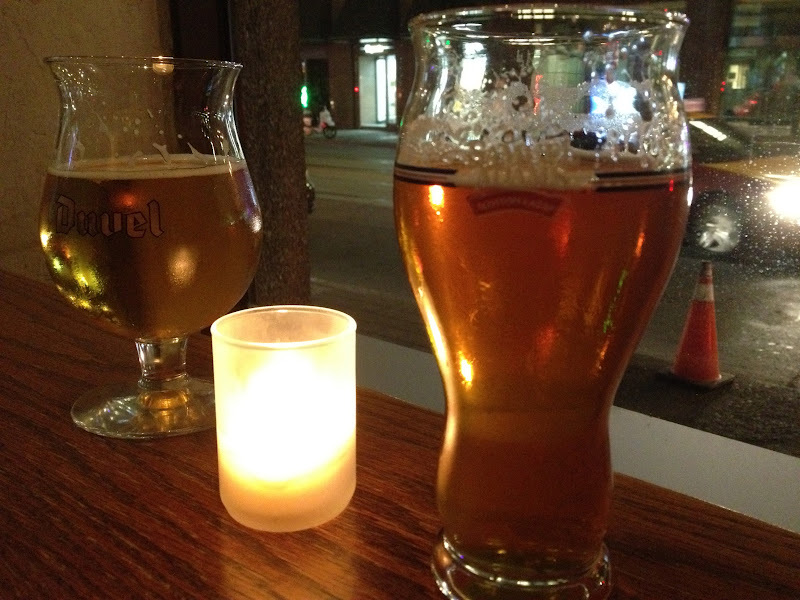 After trying a few samples we went with a pint of DUVEL and a pint of SAM ADAMS to enjoy with our food. To eat, we ordered a few small plates so that we could try a few things. The WOOD SMOKED BUFFALO WINGS were marinated in a fruit beer, and splashed with a chipotle hot sauce. Served alongside the wings were the standard celery sticks, accompanied by a Quebec blue cheese and leek dip. Having the sweetness of the fruit beer was a little strange at first, but the bite of the chipotle hot sauce was a saviour, and began to mask the sweet flavour as we continued to eat more. The BACON WRAPPED JUMBO SHRIMP were served with BBQ sauce herbs and Berkshire beer bacon. The shrimp where large and juicy, but the bacon was soggy and quite fatty. The dish would have been much better if the bacon was still crispy. We were surprised to see the SPICY SALMON TARTAR arrive in cones. The tartar was mixed with smoked jalapeños, coriander and lime. This unique presentation looked nice but it was a bit strange to eat the tartar with the cone. The HOG TOWN PIZZA came loaded with Berkshire pulled pork, smoked sausage, beer cured bacon, oregano, mozzarella, and garlic. This pork-heavy dish was soaked with a sweet BBQ sauce which tended to overwhelm the pizza. We didn't end up finishing the pie as we found it too be heavy and rich. Finally came the BRUSSELS MUSSELS: hot mussels steamed in a broth of affligem blonde, smoked sausage, tomato, hot chilli, fennel, parsley and garlic. These mussels were cooked perfectly and full of flavour. The smoky sausage and hot chilli were a great combination which made the mussels the stand out dish of the night. Would we go back? For mussels and Beer only.